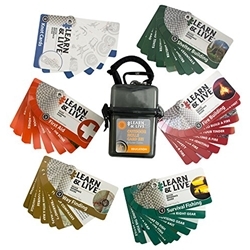 The Learn & Live Outdoor Skills Card Set includes a collection of pocket reference guides covering the fundamentals of five imperative survival skills. Knot Cards - Everything you need to learn and practice a variety of useful knots applied outdoors. Way Finding Cards - A pocket guide to help learn how to navigate using maps, compasses, and more. Shelter Building Cards - Informative cards describe a variety of different emergency shelters and provide how-to directions on how to build them. First Aid Cards - Useful tips to treat minor injuries when someone is hurt in an emergency situation. Fire Building Cards - Cards outline step-by-step how to successfully build a fire in the outdoors. Survival Fishing Cards - Feature useful tips and methods for catching fish in survival situations.